Charming. Mysterious. Romantic. Venice, the Italian city formed of 117 small islands separated by a maze of canals and waterways, is a unique destination. But there is a particular time of the year, between February and March, when the city's atmosphere becomes even more dramatic: Carnival. The two-week festival has its roots in old pagan and Catholic rituals. The first recorded Carnival in Venice was in 1268, and after a halt from 1798 onwards due to Austrian control, the celebrations were revived in the late 1970s. In the distant past, Carnival was a brief period of promiscuity and intemperance, tolerated by government and church alike. Masks and heavy cloaks were used to disguise one's identity and wipe out differences of rank or wealth. Men wore the traditional bauta costume made of a black coat (tabarro), a black cocked hat and a white mask (larva),while women wore the moretta, a black velvet oval mask. 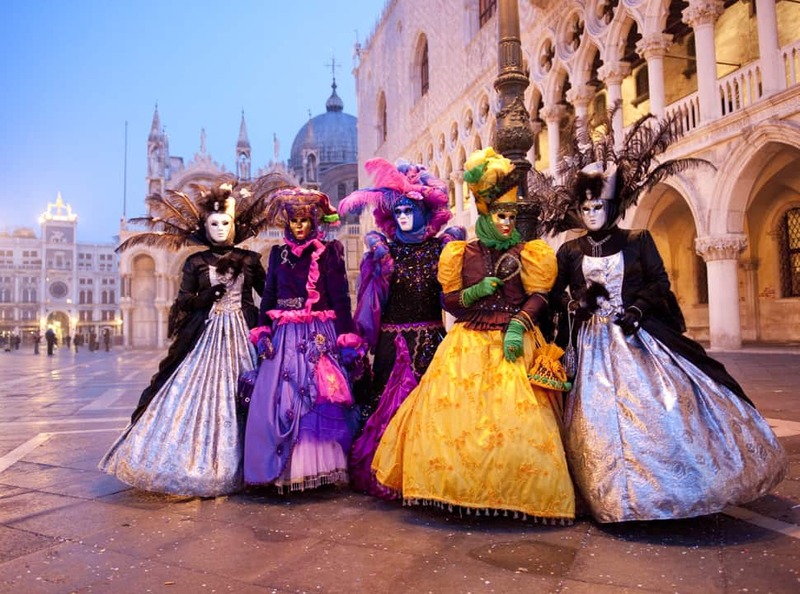 Today, Venetian Carnival is a fun filled event that still maintains the arcane character of its origins; the ageless look of the city and the ethereal wintry fog only add charm to the experience. This year the Carnival runs from 31 January to 17 February. Following Milan's Expo 2015 theme “Feeding the planet”, the official theme is the pleasures of good food, wine and conviviality. Monica Cesarato, a local food blogger and culinary guide who runs cooking lessons and food tours, is enthusiastic: “I think it was about time we concentrated on what we are good at: food and wine! The Veneto Region is still very under-rated when it comes to food and wine. So I am glad that the theme of this year's Carnival is Good Taste. I am looking forward to show people how well you can eat in Venice. It would be nice for visitors to try some of the most typical dishes, as well as some others not so equally known, like seppie in nero, （cuttlefish with their ink), poenta e osei (cornmeal mush with wild birds) or risi e bisi. (rice and peas). During Carnival, the whole city is thrown into a hectic whirlwind of costume parties and fancy dress balls. The main squares and buildings become the set for parades and historical re-enactments. The most famous one is the Grand Theatre in Piazza San Marco, which has a big stage with nonstop shows, parades and concerts. Crossing a bridge or walking by a campiello, or small square, one can easily stumble upon masked figures. Bauta and Moretta often give way to lavish seventeenth-century costumes recalling the Serenissima magnificence of Venice in the 1700s. But there are also modernist, fantasy costumes inspired by Nordic Gothic culture. “The Venice Carnival is different from any other,” costume designer Francesca Serafini says. “We don't have confetti or samba dancing. It is not a masquerade, but a way of living a dream, and to be involved in the city's magic.” Owner of the Antico Atelier in her native Padova, a town 35 km from Venice, Serafini studied sculpture in Venice and fell in love with the city and its carnival. “It all started by chance,” Sautter told Hi-Europe. “A BBC director and Monty Python's Terry Jones came into my shop to ask my help in finding someone to create costumes and set design for their re-enactment of the Fourth Crusade, which included Doge Dandolo's character. I put myself forward and the Ballo del Doge was born». Every year since, the Palazzo Pisani Moretta hosts this flamboyant party, attended by enthusiasts and celebrities from everywhere. Rigorously disguised, guests arrive on a gondola and as soon as they enter the palace they walk into a magical world born out of Sautter's imagination. Antonia thoroughly researches historical sources to create costumes, scene designs, music and choreography. With her staff of 25, she works all year round to design everything to the smallest detail. On the night itself actors, performers and musicians bring her vision to life. Every year the ball has a different theme: in 2015, as the ball will be held on the 14th of February, it is Cupid in Wonderland, “a tribute to love in all its shapes.” Guests are free to choose their costume, but they have to stick to the Venetian tradition – be it authentic or innovative – and to its standard of beauty, as they are part of the show themselves. “I want to give a beautiful representation of Italian style. Style is what makes the difference. I'm conscious of the responsibility of conveying Italy's positive image to the entire world,” Sautter told Hi-Europe. Many of her guests come from abroad, and a few years ago she took a sample version of her Ballo del Doge to Shanghai as part of Grazia Magazine's third birthday party. The Carnival of Venice clearly knows no boundaries.